And she was serious about being young. As far as records indicate, Maria’s graduation from McKendree at only 19 years old makes her the youngest graduate in modern history. Twice, during elementary school and high school, Maria was so far ahead of the established coursework that she advanced a grade, ultimately leading to an early high school graduation at age 15. Not only did she follow in her sisters footsteps, her mother’s career as an educator helped shape her path to becoming a teacher. In 1989, she graduated with a degree in English and secondary education and later returned to obtain a master’s degree in education. “I knew that if I chose the education profession, I would want to teach the subject that allows the greatest amount of self-expression,” she said. She now teaches creative writing and video journalism to seventh and eighth grade students in the Ladue (Mo.) School District. She also leads a unique eighth grade class called “St. Louis Adventure,” where students first learn about the history of the city, then study city maps, streets, and the public transportation system. Armed with their classroom knowledge, the students then travel from Ladue Middle School to downtown St. Louis to visit organizations for a career exploration day. “We partner with major corporations and private entities that are willing to engage our students in dialogues about their companies and the career opportunities within them,” she said. “In past years, my students have visited Ameren Missouri, Peabody Opera House, KMOV, The Fox Theatre, and the St. Louis Post-Dispatch, just to name a few.” The class affords the students an opportunity to apply acquired knowledge to real-world situations. She absolutely loves the rewarding feeling that comes from being a teacher. “I love seeing students excited to participate in the learning process,” she said. “It is also quite rewarding when students return a year or two later to thank me for something I taught them. They often comment that they were not necessarily grateful at the time, but they later recognize the importance of the lesson.” Maria is proud of the district she teaches in because its educators “put students first and their test scores generally showcase that fact.” In 2011-2012, the district was named the Missouri School of Character. As a member of the Character Education committee, Maria was responsible for assisting with the compilation of information used to obtain this distinguished character status. 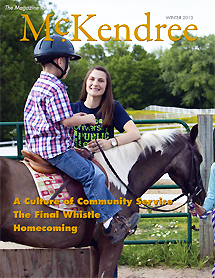 And with the little free time she has between teaching, assisting with Ladue School District groups and functions, and raising a family, she is playing a large role at McKendree as the Alumni Association president and a Board of Trustees member. Elected in June, Maria has been involved in the association for several years, serving as first-vice president and homecoming chair. She says she is ready to take the reins and lead the organization in a new direction.